Drivers considered normally resident in Greece are required to get an άδεια οδήγησης/adeia odigisis (AO) — also called δίπλωμα οδήγησης/diploma odigisis or driver’s license/permit — by taking lessons at a driving school and passing written and practical tests, if not already in possession of an unexpired license issued by an EU/EEA member state. Anyone with an unexpired license issued by an EU/EEA member state may drive in Greece without restriction, as long as the class/category matches the vehicle being driven. *Article last updated January 30, 2015, with a major revision on May 7, 2014 from real-life experience. One update pending. The Ministry of Transport article is outdated and differs from what happens in reality, which is why I conduct independent research and believe official websites are unreliable. Many embassy/consular, government and commercial websites copy these articles without second thought because they are “official,” so you are not necessarily getting confirmation from different sources. I also caught some of these websites reusing my translations, information and first-hand experiences without permission on more than one occasion. If your license has already expired and it’s not possible to renew it in the country that issued it — or you are seeking a license in a different category (i.e. you have a motorcycle license and want a car license) — you must go through the normal process described below to drive legally. *I am looking for someone who went through the process of getting a class A license and took notes on his/her experience. — Applicant must forfeit this license to get a Greek license. For most people, residency in Greece begins after a stay of 90 days and/or by registering for utilities (cell phone, phone, electricity, water, etc.) and/or upon signing a lease, mortgage, car loan or other contract. Your nationality/citizenship determines when to start the process. Find a driving school and sign up for mandatory lessons. In nearly every neighborhood, there is a σχολή οδηγών/scholi odigon (driving school) with certified instructors. Ask residents in your area for a recommendation or visit a few schools and choose one. Each school has a different schedule of classes and pricelist, and classroom lessons can begin immediately. *A friend who took lessons in March 2012 paid 500 euros for theory classes and driving lessons and 150 euros for the final driving test fee, which covers the cost of your instructor to attend the exam and bring the school’s car. It may be cheaper or more expensive at the school you select. For cars and scooters/motorcycles, students must spend a total of 20 hours in the classroom for driver’s theory, plus one hour on the Ministry of Transport computer practice test. Study materials are available in Albanian, English, Greek and Russian, but language assistance at the school depends on staff. Questions on fuel economy and environment were added in 2009. See “Ερωτήσεις Οικονομικής – Οικολογικής Οδήγησης” in four languages. Practice tests can be found at Τεστ Οδήγησης in Albanian, Greek and English. The school submits elements from ‘Documents and fees’ (below) to the Ministry of Transport to issue a learner’s permit, which is an A4-sized paperboard (karta) with the candidate’s personal info and space on the front/back to record final exam results. It is good for three (3) years. For category B – automobiles, students spend a total of of 20 hours practical driving with an instructor, in a stick-shift (manual transmission) car provided by the school. It is by appointment. Photos, documents and fees for the driver’s license should be collected and paid before practical driving lessons start because the Ministry of Transport needs to issue a learner’s permit (karta). *Some doctors request two (2) photos for each health certificate; some want one (1). I carry extras, as it’s better to have too many than too few. *If you already have a Greek license in a different category, you will be asked to pay 27.02 euros. – Dual Greek citizens who have a name different than the transliterated Latin name should provide a photocopy of a non-Greek passport or birth certificate or other official document specified by Greek authorities. *Effective November 7, 2011. See section below called, ‘How is my Greek name written in Latin?’ for more information. Candidates may also specify blood type by submitting a document issued by a private doctor, lab or hospital, though this is optional. Sometime in 2014, the Ministry of Finance said it intends to allow applicants to pay fees online via the TAXIS website (gsis.gr). I will update when it’s operational. The driving school instructor decides when you are ready to take final exams. If you are not ready upon completion of the required number of hours in theory and/or practice, you may need to attend and pay for more lessons. If you are ready, the written test is scheduled at the “Ministry of Transport office” nearest you. The school can give you the address. — If you do not show up for your appointment, there is a 15-day penalty before making another. — If the test is not in the language you indicated, you can tell them you are a no-show and wait 15 days or fail intentionally and wait one week. Talking or cheating is an automatic fail and disqualification from taking the exam for six (6) months. When everyone in the room has completed the test, results are printed and disclosed on the spot. You must score 29/30 or 30/30 to pass. — If you get more than one wrong and fail, there is a one-week waiting period during which you need to attend and pay for more theory lessons, then make an appointment and take the test again. If you fail it a second time, you must attend and pay for more theory lessons, make another appointment and take it again. — If you pass, take the results to the driving school and have the instructor schedule the final driving test. Results are recorded on your learner’s permit, then signed, stamped and returned. You and the instructor go together to the driving test with the school’s car; you will need to show your learner’s permit and Greek ID (Greek citizens) or residence permit/certificate/card (non-Greek citizens). Two examiners sit in the back seat, and the instructor sits in the passenger seat. Test is only administered in Greek. First part is oral. Examiners ask you questions about the vehicle. Second part is driving, which can include parallel parking in four maneuvers, driving on a highway, reversing around a corner, changing lanes, entering an intersection and respecting right of way, shifting gears on a hill. It lasts approximately 15-20 minutes from start to finish. — Some people come back early if they fail. — Some people are kept longer if examiners need more time to gauge a driver’s abilities before passing or failing them. You are only allowed to make one major error. A serious mistake is cause for automatic failure and an immediate end to the test. Results are easy to understand. — If they give back your learner’s permit, you failed. You will be required to take and pay for 10 hours of practical lessons before taking the test again. — If they keep your learner’s permit, you passed. You do not get a paper or interim/temporary driver’s license, if you passed. In the event you are stopped by police, they pull records from the Ministry of Transport database and see a license is being processed under your name/AFM. What happens after passing both exams? A red ‘N’ should be placed in the back window of your vehicle for one (1) year, which informs everyone that you are a new driver. There is no standardized ‘N’ sign — some people purchase tiny T-shirts with suction cups from Jumbo, others tape up plastic signs from auto supply shops; I’ve also seen paper signs that look homemade. The examiner sends your learner’s permit with results to the Ministry of Transport regional office, which forwards paperwork to Greek police. They oversee printing of the license and then send it back to the ministry. It can take 20 to 30 days for license issuance, according to the driving school and ministry, though it can take longer if your photo or papers are rejected. The driving school follows up and/or you inquire at the ministry or check its progress online at, “Εμφάνιση της προόδου εκτύπωσης άδειας οδήγησης.” It is only in Greek and sometimes does not work or show the correct information. You or the driving school can pick it up in person at the local Ministry of Transport office, when ready. Living in Greece – may not be reused. 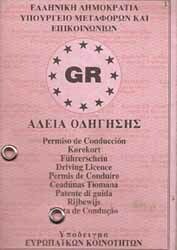 The majority of drivers in Greece have the pink paper booklet permits (above), which are valid in all EU member states until the year 2033 or until the driver reaches age 65. New licenses issued since April 1, 2009 are plastic cards with layers of security (photo at top of article), which harmonizes with an EU directive made mandatory on January 19, 2013. It does not have a microchip or swipe strip, so it cannot store personal records or fingerprints. Date of issuance is the date you passed your driver’s test, not when the license was printed. *A non-Greek citizen’s name is not in Greek letters; it follows the spelling on your passport. How is my Greek name written in Latin? Names in English/Latin letters on driver’s licenses are transliterated from Greek, following a formula set by ELOT 743 that harmonizes with the International Standard (ISO 843). To see your name transliterated to Latin, click “ELOT 743 Translator,” use the left column and enter your name in Greek letters. ΠΑΝΑΓΙΟΤΗΣ, followed by PANAGIOTIS OR PETER (taken from a private email). A license expires every 15 years. On the driver’s 65th birthday, it must be renewed every 2 years by submitting all the same documents and fees again. No lessons, driving or written tests are required, but renewal is not automatic. 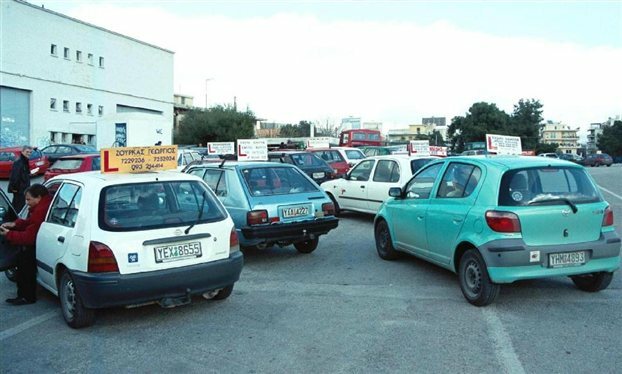 Greek driving school owners, instructors and associated personnel offering to issue you papers and certificates in exchange for fee, and without you completing any lessons or exams, face between 13 months to six years in jail. I’m curious about the length of time and expense it takes to get a Greek DL for a Greek citizen living in Delphi. He has been driving a motorcycle for years now and possibly has a license for it. You mentioned “thousands of euros” in one of your responses a post above…unclear whether it applies to this situtaion. We will be in the Delphi area this spring and I was thinking about paying for this for a cousin of my husband. I don’t want to make the offer blindly though. I would appreciate your input and if you know of one school? that has a website that I can throw into Google translator to get some understanding of the process, I would appreciate it. Thank you. My article is based on first-hand experience and documents collected from a friend who completed the process in March. If your husband’s cousin goes to all the classes and passes both tests the first time, acquiring a Greek driving license should go exactly the way it’s detailed above. However, the price remains ‘thousands of euros’ and can take months for many people because they don’t pass the first, second or third time. The best way to find a school is to look around the neighborhood of his/her location (Delphi?). It’s nice to see you again, and thank you for your question. I am a non-EU citizen and I recently passed my driving test and waiting for the license to arrive. The process that I went thru was pretty simple and straightforward. When I explained my driving instructor that I have been driving for years and I just need a driving license, he told me that I don’t need to take all lessons but just one, in which he demonstrated me what all I need to know to pass a practical test. The total fees I paid was about 500 Euros, but I was not asked for health certificate and all the paperwork was taken care by my driving school. The hardest part for me was the theory test, the question bank I was referring to had over 750 questions and I was scared that I am allowed to make just one mistake. I practiced the theory for over two weeks using an iPhone app and also did a lot of mock tests using the website (link: http://www.testdriveme.gr/). I was surprised when I actually passed the theory test. The practical test was quite easy. They asked me to do a full U-Turn in the middle of a road, a reverse around a corner, parallel parking along a curb and tested me on lane changes and road signs. All in all it was good. — The driving instructor could lose his certification and be fined for passing driver’s license candidates who didn’t complete all the lessons because he is: a) breaking the law; b) making a false statement and signing your papers. So I would keep that information to yourself. — I say in the section ‘Practical lessons’ that the paperwork is submitted by the driving school with a dilosi authorizing them to act of your behalf, but not all schools offer this service. — I don’t understand why you weren’t asked for either of the health certificates since they’re required. I appreciate that you’ve taken time to share your experience on more than one occasion since coming to Greece. I cannot find the answer I need anywhere on the internet. My husband is a Gambian national. He has a 5 year Resident Visa for Greece in his passport. He wants to travel to Canada for a visit. Does he need a visa for this or not? Because you’re in Canada, you could ask local authorities. Your husband could have also found the answer at the Canadian Embassy in Athens. There’s no such thing as a five-year residence visa for Greece, so I assume you mean a five-year residence permit. His Greek permit grants him no privileges outside Greece or the EU. The only thing that matters is his nationality and whether he needs a visa to visit Canada; if he does, he can apply at the Canadian embassy in Greece. I have an international drivering license. I am an Indian national and have obtained the relevant resident permit. I was told that I can get my international driver’s license converted to greek license by my colleagues.I wanted to confirm if this is true. Your colleagues have given you incorrect information. Only regular, full driver’s licenses issued by the countries listed in the section, “Who is exempt?” are allowed to convert to or swap for a Greek driver’s license. Further, an international driver’s license is a translation of a driver’s license, not a full, regular driver’s license. Therefore, you are not eligible. If you want a Greek driver’s license, you need to follow the steps given in the article above. I just wanted to know that i wanted to convert my greek licence to an australian licence. they have asked me to get a confirmation letter from greece regarding my licence, who do i have to ask to get it for me? and how long will it take and cost for me to recieve? You did not provide enough information for me to help you. Persons qualified to help with matters pertaining to Australia are: a) Australian authorities; b) Staff at the Greek embassy/consulate nearest you in Australia. I’m not an expert on Australia, nor am I familiar with the kind of confirmation they need, and your description is vague. Therefore, my guess is that you inquire at the Greek embassy/consulate to assist with this letter or you could contact the Ministry of Transportation (YME) in Greece directly. Your questions are already answered in the article above. 1. You could have swapped your Canadian license for a Greek one without lessons or tests BEFORE it expired, as it says in “Who is exempt?” Too late. 2. The article gives step-by-step instructions. It’s based on real-life experience. Please take a look. 3. As it says under “Documents and fees” in #10 and “Final exams,” you can take the written in English but the driving exam is only given in Greek. The information can only help you if you help yourself. Good luck. I’m going to be working in Corfu for about 9 months. I have an English provisional licence to drive a scooter up to 125cc so long as I display “L” plates. Can I do the same in Corfu? I wont be hiring the scooter, but given the use of one. Hope you can help with information on this. I know nothing about UK laws and how they harmonize with Greek laws, as I’m a non-EU citizen and have never lived in England. Please try http://www.livingincrete.net. She’s a UK citizen living/working in Greece longer than me and is very knowledgeable on these matters. You should find the answer you need in the ‘When to apply’ sections of “Converting to a Greek driver’s license” or the article above. The most important thing is if you meet all requirements. You didn’t provide enough information for me to answer your questions. However, if you look in ‘Basic criteria’, it says you must be normally resident in Greece. If you’re living in the UK, you don’t meet this requirement and cannot obtain a Greek driver’s license. If you already have a motorcycle license issued by the UK, you can use that during your visit to Greece as it says in the second paragraph of the article. HI…. I obtained my drivers’ licence in 1982 in Zimbabwe = ex. Rhodesia, Africa. I kept renewing it and to this date my licence is still valid. Am I allowed to drive with it in Greece? No one can advise you because you didn’t give enough information (citizenship, if you’re a tourist or resident of Greece and how long you’ve been here, if you’re in possession of an IDP, etc.). However, you should be able to determine the answer by reading the article, as it provides very detailed info on whether you need a Greek license and when/how to apply. My guess is you’re a Greek citizen living in Greece, so your Zimbabwe license isn’t valid and you need a Greek license to drive in Greece. I have a mexican license that hasn’t expired, I also got an international permit in Mexico that I’m using nowadays. Do I really need to go through all this process? cause I didn’t see Mexico in the list of foreign countries that can make the conversion of their licenses. You didn’t provide enough information for me to definitively answer your question, but the article above is clear about who can swap and who needs to go through the process detailed above. If you’re living in Greece and are not a tourist, yes you’re required to get a Greek driver’s license. thanx for all the info.they are very useful.do you have any idea if in the list of the countries that a dricing license can be converted to a greek one is now also included Albania? All articles are updated on a rolling basis. If a country isn’t listed, it’s not included.